What do you learn when you examine the searches of internet users? That is the question SIAL asked itself while reviewing Google's recent "Food Trends 2016" report, which analyses the major food trends of Americans based on their searches recorded between January 2014 and February 2016. Pho soup, rigatoni and functional food seem to be popular. Review of the results with SIAL which—though they may allow us to get a feel for users’ searches in real time—remain limited in relation to overall economic forecasts. The ranking of avant-garde foods of the moment reads like an 18th-century delicatessen list: (oats, cheese curds, and sourdough bread...) reports The Atlantic, with a touch of humour. Surprising result? We are still not modern, then. The recent "Food Trends 2016" report reveals that our searches are primarily focused on the word combination "Food + health" and not, for example, food of the future, following the example of proteins of the future, meal-replacement drinks or indeed the use of technology to increase flavours and tasting experiences. This report therefore does not tell us much about the future of tastes, concludes The Atlantic. It is primarily aimed at restaurateurs and instagrammers who want more visibility on the web to reach the top Google results pages (Alexa Rank). But is it not also an essential index to target the expectations of the future consumer in the best way possible? Indeed, although we learn that the food choices of Americans continue to be schizophrenic, one thing is clear: internet users are seeking healthier food. For example, we see strong interest in "artisanal" foods, even if this still sometimes relates to "Domino's artisanal pizza"! Internet users also want to know what they can do with their turmeric, an ingredient recognised by numerous studies as having health benefits. They want to understand what is hiding behind these functional ingredients, the benefits of which are seen as truly mysterious by the consumer. In this way, interest in turmeric, which has been declared the best anticancer spice, grew +56% between November and January of this year. "Americans are turning to food to fill needs beyond hunger or cravings. They want to be educated on the impact of each ingredient on one's body, and how to optimise their diet in order to look and feel their best"
Google also drew up a ranking of our culinary interests in terms of recipes. The term with the biggest increase: the "cake pop", a lollipop-shaped cake, which saw an increase of +63%. However, we quickly notice that people are searching for health benefits. Among the searches that have seen the biggest increase are terms such as "health food stores near me" (+287%). In the same way, internet users are wondering about so-called "healthy" foods such as almond milk. The search "is almond milk healthy" has seen increased interest of +390%, for example. We also note that there is increased interest in exotic flavours, and specifically Vietnamese food, with pho soup increasing 11% every year since 2013. It is most fashionable on the West coast and in Denver. The Google analysts explain that users have lost interest in certain recipes, such as "gluten free cupcakes". 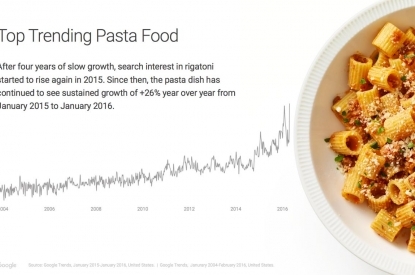 Pasta, meanwhile, is making a strong comeback in all its forms, with rigatoni leading the way (+26%). Therefore, although Google knows what we are eating, as claimed in the headlines of the French press, the conclusions provide a snapshot of our daily life, reflecting the reality of the market. The “Food Trends 2016” report is therefore better interpreted as an indicator of purchase intent among consumers, rather than a concrete trend predictor. The INSEE was clear in its 2015 report, “The Ability of Google Trends to Predict French Conjuncture: Limited Results”: “The searches carried out by web users are revealing but are limited in their ability to realistically predict economic realities”. The perennial nature of the results should regularly be checked. What’s more, the results are apt to be highly varied, due notably to the heterogeneity of the individual products’ evolutions.